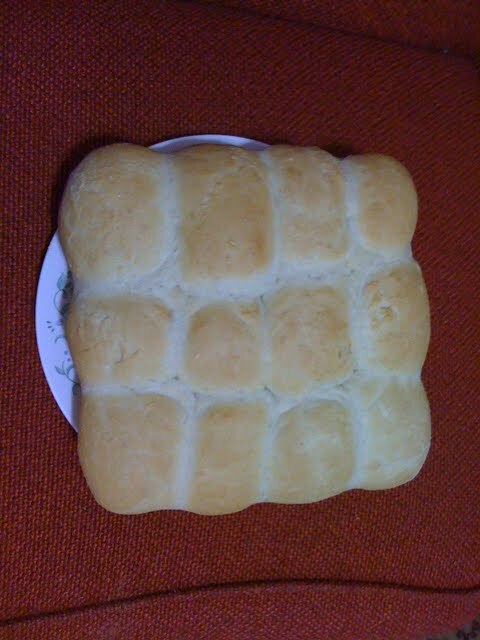 By now, the bread dough should not stick to the hand. If it sticks add little more flour and knead well and make a ball with it and cover it with a cloth squeezed out with water. Leave this aside for 45 min to 1 hour. After 45 minutes, the size of the consistency is increased by 3 to 4 times to its actual quantity. Aerinate, beat the flour with good punches with the hand on to the flour mixture. Just few beats to aerenate the flour. Greeze the oven pan with little butter. Sprinkle bread flour on top of it on all sides of the pan. Take the dumplings of size as required and place the dumplings on the pan. Leave the pan for 10 to 15 minutes outside and then place the pan in the oven for 40 minutes to an hour. Check the bread now and then till it is cooked properly. Can check it by pricking the bread with a tooth pick. If the pick comes out without any flour onto it, then it is properly cooked.